Have you ever seen Thai fruit carving instructions that ask for Thai pumpkin? Or maybe the instructions just ask for pumpkin but it doesn’t look like the American pumpkin that you may be familiar with? 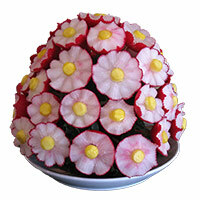 That is what I experienced when first trying to learn fruit carving. Since then, my Thai friends and teachers have introduced me to Kabocha squash. This is what the Thai refer to as pumpkin. It is a wonderful fruit to carve with a nice smooth texture and beautiful yellow orange flesh and contrasting dark green skin. It’s softer to carve than butternut squash and smoother and less stringy than what we commonly refer to as pumpkin here in the USA. 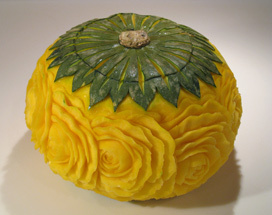 And there are so many things you can carve using kabocha squash. Take a look at this short video to learn a bit more about Kabocha squash and things you can carve with it. I just learned that California is a main grower of Kabocha squash. I find that kind of interesting because last week, I had to visit 5 grocery stores in order to find some. And I live in California! It turns out the much of the California crop is exported to Japan. If you can’t find Kabocha squash in your local market, try looking for it in a market that carries a good supply of Asian foods and produce. You’ll probably find it there. 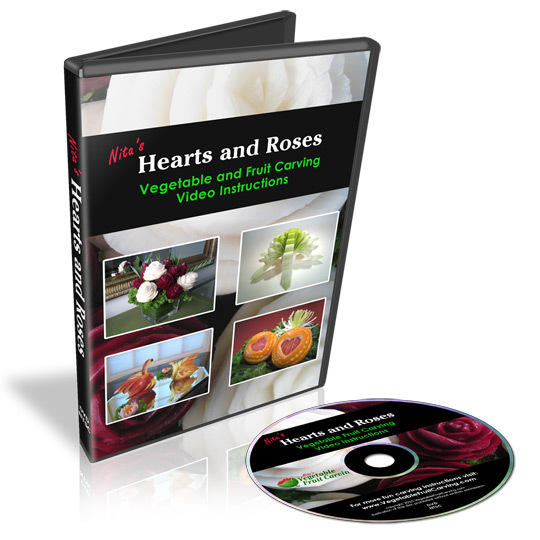 As I mention in my video, the overlapping rose technique is taught in my video lessons, “Carving Watermelons – Roses Buds and leaves”. 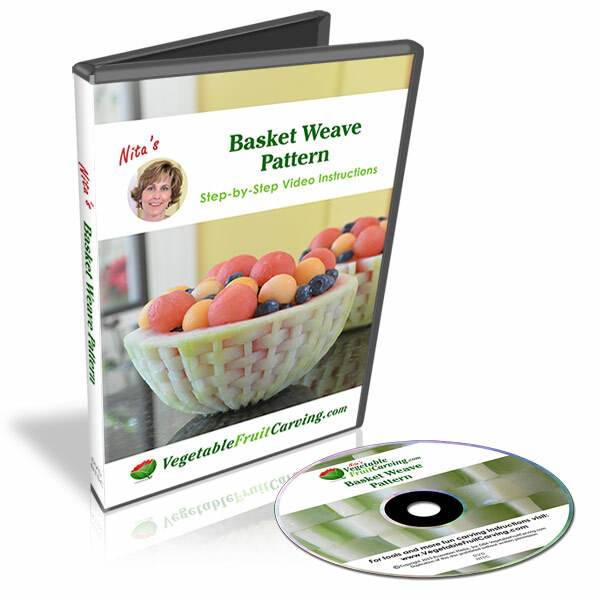 This lesson is available as an individual DVD as well as being one of the weeks lessons in my “Vegetable and Fruit Carving 101 – Eleven Week Course for Beginners”. You can learn more about them and see other lessons and tools on my shop page. Thai Pumpkin Carving with light inside makes a pretty pumpkin lantern decoration for the evening. 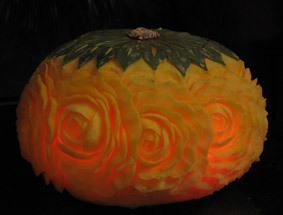 If you already have my Carving Watermelons lessons, or if you already know how to carve roses on melons try carving roses into Kabocha Squash otherwise know as Thai Pumpkin or Japanese Pumpkin. You’ll have a lovely long lasting carving that is beautiful in the day and can be lit from inside to make an impressive carved lantern decoration in the evening. For more info on Kabocha squash, take a look at this article in Wikipedia.